This rich cream was developed for those who require serious skin care. With long lasting moisture benefits that are derived from a combination of specialty ingredients, it helps to repair a damaged skin barrier. It contains Idealift, a skin firmness-boosting compound, which firms up sagging skin. It penetrates deep inside skin, thereby moisturizing and smoothening it without leaving a sticky or greasy feel. Patented ceramide complex is applied and the MLE® skin barrier formula, which recreates skin compounds and structure that is the most similar to real skin, strengthens weakened skin barrier and keeps skin moist from deep inside, creating a 72-hour moisturizing effect. The complex blend of panthenol, madecassoside, and allantoin effectively soothes sensitive skin. What is a skin barrier? Skin barrier consists of dead skin cells and lipids in between cells. Located at the outermost layer of skin, it "protects the skin surface." What happens when the skin barrier falls apart? When the skin barrier weakens, moisture inside skin evaporates, causing skin to dry out.. As a result, harmful compounds from the exterior easily penetrate inside skin, possibly causing troubles. Recreates the same compounds and structure of real skin, thereby reinforcing the weakened skin barrier. "Maltese cross" structure is clearly visible when observed with a polarizing microscope. Creates a real skin barrier! Confirm with your own eyes with it is a REAL skin barrier! Maltese cross structure must exist to confirm that it is a real skin barrier! 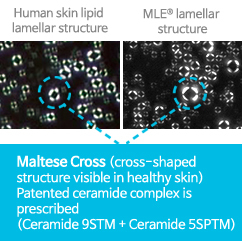 Confirm with your own eyes-clearly visible Maltese cross structure appears after using the MLE ® skin barrier formula. 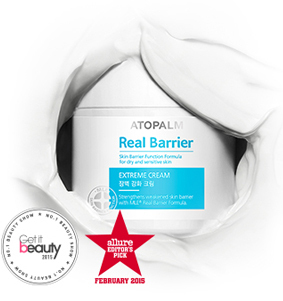 Atopalm Real Barrier uses Multi Lamellar Emulsion (MLE ®) technology, which reinforces the skin barrier that you can confirm and observe with your own eyes. 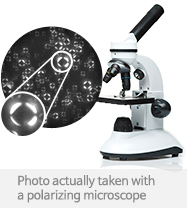 A Maltese cross structure can be seen through a polarizing microscope in Atopalm Real Barrier Cream. The crosses reinforce the weakened skin barrier function. As a highly enriched real-barrier soothing complex that contains panthenol, allantoin, and madecassoside, it instantly soothes skin turned sensitive because of external stimuli. Also, it protects skin from becoming more sensitive. INGREDIENTS: WATER, CAPRYLIC/CAPRIC TRIGLYCERIDE, BUTYLENE GLYCOL, CETEARYL ALCOHOL, GLYCERIN, PROPANEDIOL, PANTHENOL, STEARIC ACID, GLYCERYL STEARATE, POLYGLYCERYL-10 DISTEARATE, ACETYL DIPEPTIDE-1 CETYL ESTER, BIOSACCHARIDE GUM-1, SORBITAN STEARATE, OLEA EUROPAEA FRUIT OIL, HYDROGENATED VEGETABLE OIL, VISCUM ALBUM FRUIT EXTRACT, DIMETHICONE, MADECASSOSIDE, SODIUM HYALURONATE, MYRISTOYL/PALMITOYL OXOSTEARAMIDE/ARACHAMIDE MEA, DIHYDROXYISOPROPYL PALMOYLPALMAMIDE, PHYTOSTEROLS, ALLANTOIN, TOCOPHERYL ACETATE, CARBOMER, 1,2-HEXANEDIOL, CAPRYLYL GLYCOL, LAVANDULA ANGUSTIFOLIA OIL, CITRUS AURANTIUM DULCIS OIL, VETIVERIA ZIZANOIDES ROOT OIL. Use AM or PM after cleansing with CREAM CLEANSING FOAM or CLEANSING WATER. Apply INTRO SERUM and wait a few seconds for it to be absorbed. Then, using the enclosed applicator, scoop EXTREME CREAM and apply to fingertips. Smooth over entire face and neck in an upward motion. Average Customer Review: 4.5 of 5 Total Reviews: 164 Write a review. I have an extremely severe skin disorder as a result of a chromosome defect. After dealing with the past 3 year flare my skin was a mess. I used the cream for only a few days and saw healing that I have never seen in over the last 40+ years. After a little over a week of testing in certain areas, I started using it in others to find that the areas all began to mend and clear. I have reported this product on a facebook site dealing with the same issue I have. To date I am aware that at least 14 other sufferers have ordered this product. Thanks so much for making it available to us all. I have a severe skin issue from a chromosome defect. After using numerous skin creams during the healing stage I had about given up on anything that would moisturize and help heal the damaged skin. After one week of using Real Barrier, I found the skin to feel more normal with no pain, dryness and shedding as experienced before. I highly recommend that others with severe dry skin issues of this nature try this product. Get updates on new products, special offers & so much more! © Copyright 2018 Neopharm USA. All Rights Reserved. The statements made in this website have not been evaluated by the Food and Drug Administration. All information presented here is not meant as a substitute for or alternative to information from healthcare practitioners.